Random Panel: A thousand words, two periods. Genius. 15 Responses to Random Panel: A thousand words, two periods. Genius. Not to mention he can’t spell important either. This dialog balloon is just chock-full of solid gold writing, kids! So, like, the old dude had a weird ant inported from Mars in order to entice The Shark into some kinda mud wrestling thing, that will be televised, yes televised, and he finds his sharky piercing eyes so photogenic, and I will come to the point, boring and lobotomizing, but in a good way, he has mastered the element of run-on sentences, yes running, with powerful young sharky muscles rippling, without Lava Girl interfering, of course, THAT’S WHY DR. FUDD E. DUDDY NEEDS SHARK! Yo, JH! Does The Shark even have a fin on his costume? Shouldn’t there have been a “too late” inserted somewhere when he says he will come to the point? No, the Shark just has a blue mask and blue swimming trunks. Sometimes he has webbed feet, too! I love the “to” that was inserted between “fly” and “mars” after the fact. Its hanging out in the gutter is a sure sign that the letterer just *oops* left it out. Clearly he didn’t want to re-write the whole dadgum thing, so he just squeezed it into the margin. Professional to the last! Good point John. Reading these old issues it’s also very apparent that the concept of letting the art tell the story had not yet been developed. Most pages have very text-heavy boxes explaining what’s going on, giving history, or just characters having verbal diarrhea like this guy. Two words for you. De. Caff. Oh no! 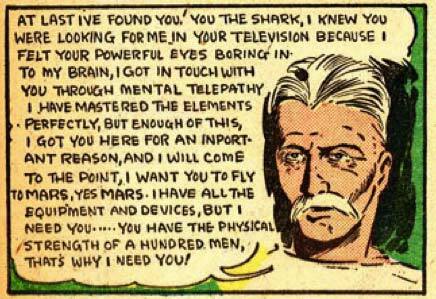 It’s the Shark’s nemesis, Run-On Sentence Man! That’s “Exposition-Man” to you, Niall! This reminds me of the dialogue from old radio shows, if you ever hear them. They describe everything. Also the 80s Superfriends cartoon. I caught an episode of it many years later, and I remember the dialogue was something like this. Lex Luthor: I’ll use my giant laser to cut the moon in half! Superman: Lex Luthor is using a giant laser to cut the moon in half! Batman: We have to stop Luthor from cutting the moon in half with his giant laser! Misspelling of the day: “Inportant.” He apparently believes in neither periods nor spell-check.